Editor’s note: Today we’re proud to introduce to our members the latest addition to our growing family of contributors, Joe Parello. Joe’s name may be familiar to astute followers who recall his byline from his year as a sports editor and reporter for GoLocal Worcester in 2012-13. He’s also deputy editor and cofounder of SuiteSports.com and a frequent contributor to ESPNBoston. The Worcester Warriors don’t look like your average lax bros, in more ways than one. 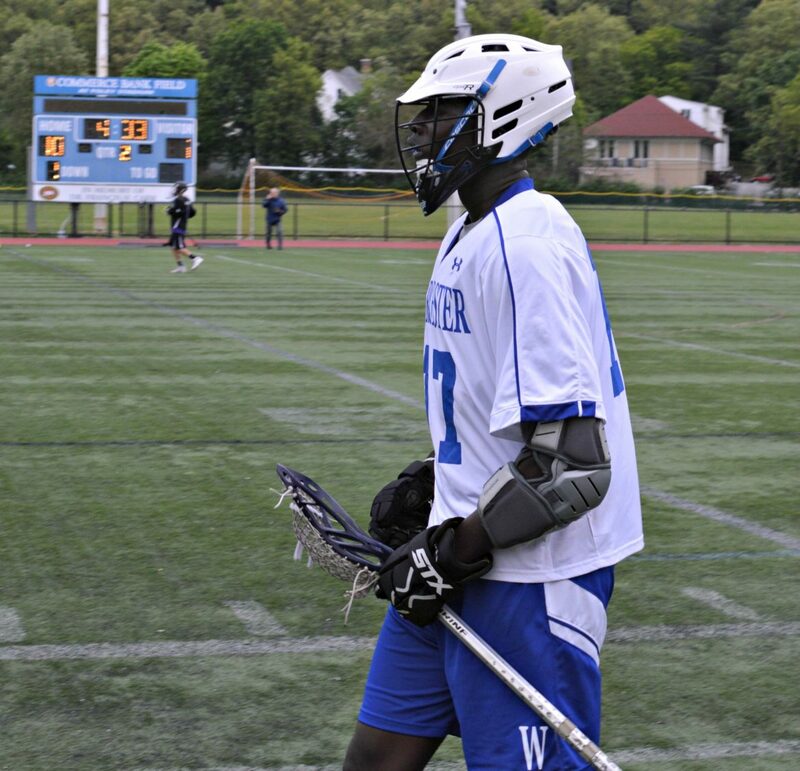 The team doesn’t have all matching helmets, for starters, and the ethnic makeup of the group is far different from many of the programs Worcester goes up against. 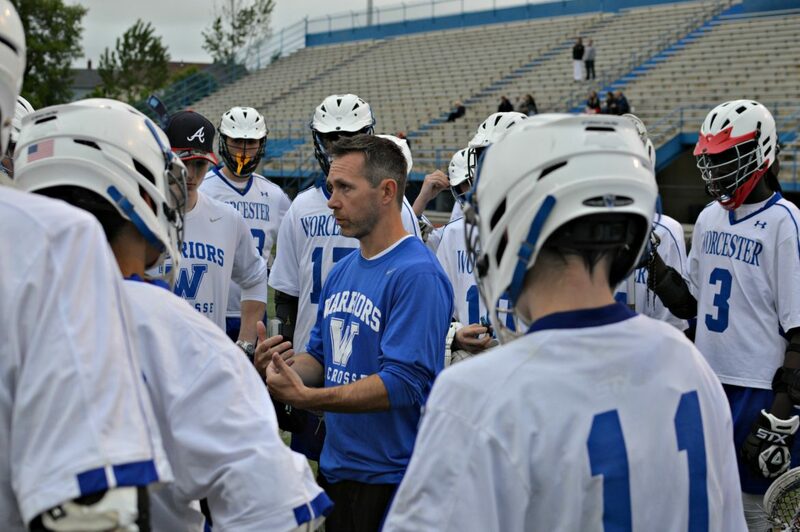 Harry Jones has coached the combined Worcester high school boys lacrosse team to its third straight postseason appearance. “We do feel a little bit out of place, but we embrace that,” senior Kyle Farrell said. “As raw athletes, we are a little out of place. Yeah, not all of our helmets match, and we don’t have a booster club. We don’t even have a JV program. It is what it is, and we do our best to make it work. Our uniforms might not all match, but that’s OK. The Warriors, under the highly motivated guidance of coach Harry Jones, have indeed been standing out the last few seasons. The program’s ascension to the ranks of contender, though maybe not in your stereotypical lacrosse town or well-heeled fashion, should probably come as little surprise. Lacrosse is the fastest growing sport in America at every level, and by every conceivable metric. In 2001, only 253,000 male and female athletes participated in lacrosse at the youth, high school, college and pro levels. Today there are nearly 280,000 boys in youth programs alone, and total participation has ballooned to over 770,000 across both genders and all levels of the sport. The number of boys high school teams has also spiked, jumping from just under 97,000 in 2006, to over 172,000 when US Lacrosse took its latest participation survey in 2014. Check out Joe’s breakdown of the Division 2 Central/West boys lacrosse tournament on SuiteSports.com. Worcester is seeded 13th and will face No. 4 St. John’s in the first round at 4 p.m. Tuesday in Shrewsbury. Still, out of all those teams, you’d be hard-pressed to find one quite like WooLax. Worcester Public School’s combined boys high school lacrosse program doesn’t fit the mold of a lax power. This isn’t a private school, like local power St. John’s, and these players didn’t come up through the youth programs of affluent suburbs, like many of the players at regional mainstays Algonquin, Shrewsbury and Westborough. 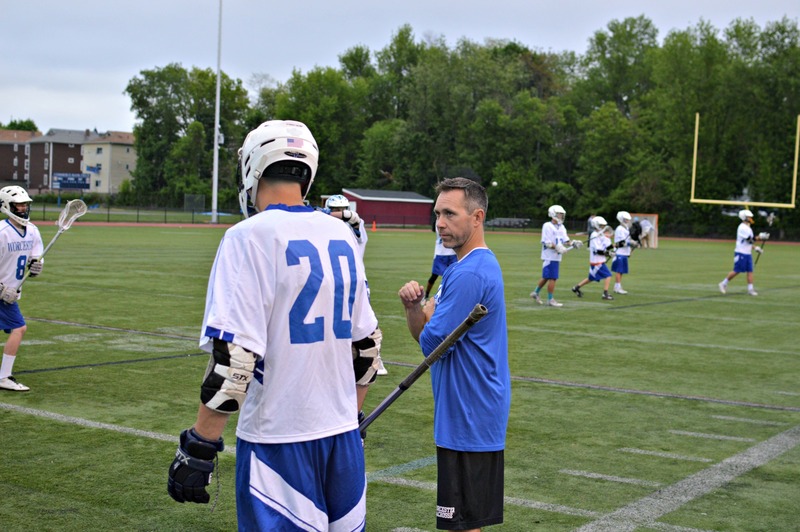 In fact, many of Worcester’s boys never held a lacrosse stick before their first day on the field with coach Jones, but that hasn’t stopped this program from developing into one of the best in Central Mass. Worcester players (here, Mike Mahoney, 16, and P.J. Sharry, 11) have more to celebrate by the game. 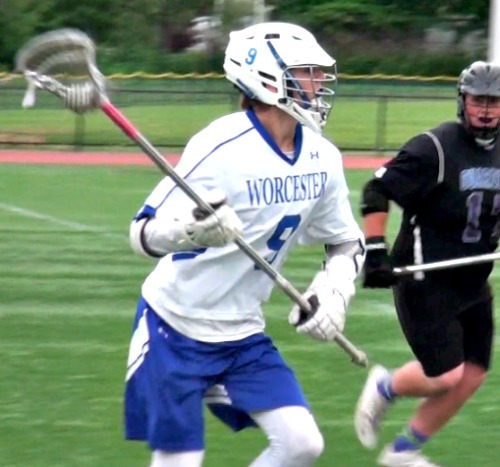 This week, Worcester will participate in its third consecutive state tournament, but it’s been a long road for WooLax. In 2006, under then-coach Tom Langan, Worcester began its second season with a win after Northbridge forfeited the opener. The Warriors wouldn’t win again until May 2012, a span of over six years, and a losing streak that reached 99 games before the Warriors finally broke through against Assabet Valley Tech. After the 2009 season Langan stepped down, and former Shepherd Hill junior varsity coach Harry Jones applied for the position. This job was unlike anything Jones had seen. A native of lacrosse-crazy Camillus, N.Y., Jones played under legendary coach Mike Messere at West Genesee High School outside of Syracuse. After playing junior college lacrosse at Herkimer College, one of the best JC lacrosse programs in the country, Jones earned a spot on the roster at national power Syracuse University in 2001, where he would play under another legendary coach, Jeff Desko. Jones had served as the head coach of state power Weston earlier in his coaching career, and is friends with numerous Division I college coaches from his playing days. Jones talks with Joe Arsenault. Lacrosse is in his blood, but now he was the head man of a program where nearly every player was picking up the sport for the first time. Running a lacrosse team isn’t cheap either, and with a tight budget, Jones often found himself spending his own money to buy equipment. It has become almost an annual tradition for the coach to give away his stick to one of his players after enough sticks break. Jones estimates that the majority of the pay he receives for coaching the team goes right back into the program, but he has been thrilled to see parents get more involved the last three years, helping the team pay for uniforms and equipment. As it turns out, there was nobody better suited to lead this less-than-traditional lacrosse program. While a certain air of elitism and snobbery are associated with lacrosse lifers, Jones brought a blue-collar mentality to the inner-city program. 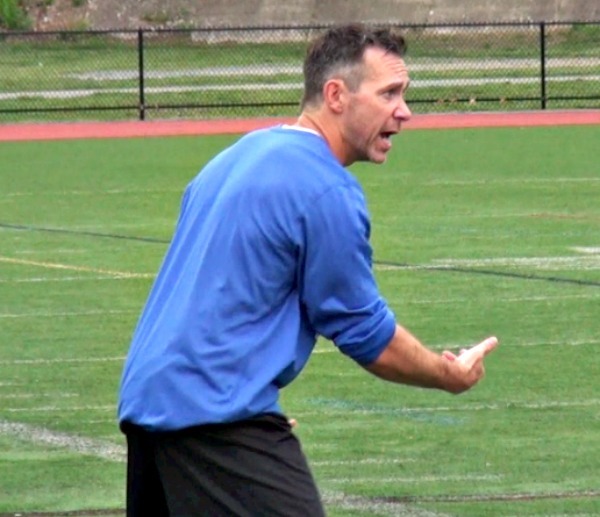 The coach obviously had the knowledge to teach basic stick skills and help the boys learn to throw and catch, but his message of hard work and fighting for every ground ball has made Worcester a team nobody enjoys facing. Even if they weren’t winning right away. “When I came in, I told the guys, ‘I’m not just trying to get you a win, I want to go to districts,’ ” Jones said of his first season on the job. “I mean, it was brutal, because I only had 14 kids, but those kids worked hard. … We still preach that. We want to win on the ground. If you can grab a ground ball, you’re going to get in a game here. Practicing on the bumpy back field of Chandler Magnet School was another obstacle for Jones, who has had to cancel practice before when the field was double-booked for Little League. He’s also seen his players blamed for broken windows, among other things. WooLax does occasionally get to practice on the turf at Foley Stadium, but the team rarely goes into a day knowing where practice will be held after school. Still, Jones has embraced the bumpy, dirt-covered practice field, and used it to instill a toughness in his team. Initially, all Worcester had was that toughness. The Warriors endured two winless seasons under Jones, as he struggled to recruit and retain players from all the different Worcester public high schools. Finally, in 2012, Jones and Worcester broke through with two wins, and doubled that total to four the following season. Those two years would lay the foundation for one of the more improbable turnarounds in Central Mass. high school sports. After winning a combined 10 games from 2005 to 2013, Worcester won its first 12 games of the 2014 season, locking up a playoff spot, and setting up a huge road game against perennial league champion Grafton. A last-second Grafton goal spoiled Worcester’s perfect start, but just five days later, WooLax would score the biggest win in program history. Then-senior Jack Gallagher scored two improbable goals, one at the buzzer of regulation, and another in overtime to give Worcester a share of its first ever league title with a revenge win over Grafton. Two weeks later, the Warriors earned their first playoff win at home against Leominster, and the program has been a contender ever since. C.J. Gallagher could be Worcester Lacrosse’s first Div. I college player. Now a junior, the younger Gallagher is on pace to become the program’s most decorated player. 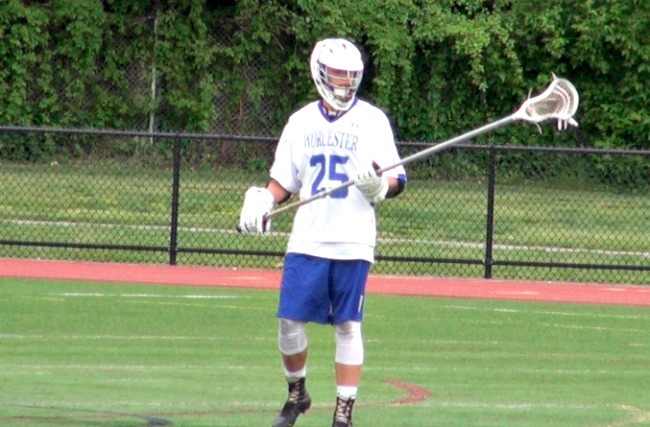 A returning all-Mid Mass League defenseman, Gallagher is garnering interest among college programs across multiple levels, and dreams of playing Division 1 lacrosse someday. It’s hard to believe he hadn’t touched a lacrosse stick until 2014. Gallagher doesn’t look the part of someone late to the game. Despite his status as a defenseman, the versatile junior is no stranger to scoring. His stick skills and shooting ability have forced Jones to let him carry the ball into the offensive zone, and Gallagher has rewarded his coach’s confidence, scoring 16 goals and dishing out 12 assists, tying him with James Goggins for the team lead with 28 points. While no WooLax alums have hit the Division 1 ranks yet, the program has produced a few college players in recent years. Brandon Hanlon walked on and eventually earned a roster spot at UMass-Boston, where he joined fellow Worcester middie Sean Racine. Luke Hanlon is among the Warriors top players. Brandon’s younger brother Luke is now a junior for the Warriors, doing the dirty work as a long stick midfielder. The younger Hanlon is a demon on ground balls, and one of the best defensive players in the region. Like his brother Brandon before him, Luke attends Worcester Tech, and is one of only four players on the current roster who don’t attend Doherty. Luke also joined the Gallaghers in leaving baseball for lacrosse. If you watch Worcester play, you’ll notice that the team is gifted with size and speed. Many are football players, like Phil Adarkwah, and others are converts from baseball and track. They’re the kind of athletes most coaches would kill for, but the obvious catch is that none of them come with lacrosse experience. Phil Adarkwah, a 6-foot-2 sophomore, is growing into his role on the team. Farrell is currently sitting out the rest of the season with a sports hernia, among other injuries, but will continue his career next season at UMass Boston as well. 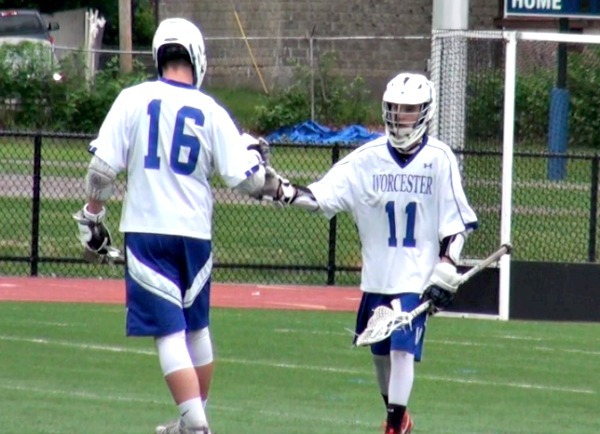 With several players moving on to play at the college level and a now regular spot in the state tournament, Worcester lacrosse would seem to be on the map. But, the program is still lacking in some departments. While Jones has brought stability to the top, he still doesn’t know how many players he’ll get each year. Consequently, the program still doesn’t have a JV or freshman team, and with no youth feeder program, that can make for some drastic year-to-year changes. But Worcester’s long-term goals can wait for a bit, because the state tournament begins this week. Considering where this program has come from, just qualifying is a massive accomplishment, but even that has already gotten old for this ambitious bunch. WooLax begins its quest for that state title Tuesday at St. John’s. Thanks for the support, Joe! These are great, hardworking kids!